Shoal Atoll is the second hidden level of Sea Breeze Cove in Donkey Kong Country: Tropical Freeze. The level seems to take place in the walls of a sunken palace, considering the damaged stonework and columns. 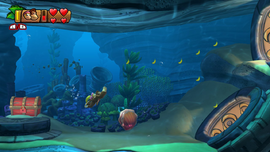 It is unique from other levels in the game, in that the primary objective is to traverse an underwater labyrinth and fetch treasure keys. Five differently-colored chests, each containing one of the keys, are scattered throughout the maze. One such treasure chest can only be opened with a key displaying the same color. The red key is the only one found outside a chest, and is to be collected first. Note: Due to the non-linear layout of this level, the following overview will describe the fastest route to collecting all keys and reaching the Slot Machine Barrel. As a labyrinth, the layout of the level is composed of numerous paths and passages. The Kongs begin on a long patch of dry land, and would have to pass by several Tucks to reach a wooden footbridge. The bridge is unstable and will fall off as soon as the Kongs step on it, dropping them into the water. Going through a nearby opening in a rocky wall, the Kongs enter a wide corridor patrolled by Blue Finleys and containing a red chest, the first one in the level to be opened. Strong currents prevent the Kongs from entering the ceiling and bottom entrances, but as they head east, they will encounter two crossing ways. They should enter the passage at the top and find an area with an air bubble supplier, a spinning Buddy Barrel, and a single Yellow Snaggles, which chases the protagonists through the water, threatening to bite and damage them. Up and past the Yellow Snaggles is another passage leading into a room with a red key. The Kongs should collect it and go through the bottom passage, which leads them back to the wide corridor, now populated with two Gordos beside the Blue Finleys. With the key in their hands, the Kongs should head to the red chest and open it, thus revealing a green key. Having acquired the key, they must return to the crossroad and pick the bottom passage this time. A narrow tunnel ending with an air bubble supplier leads to a wide room with a lonely Gordo and a yellow chest lying on a stone platform. Under the chest are a few bananas, and between two dilapidated barrels is an opening in the ground. Diving down this passage, the Kongs find themselves inside an underground portion with a green chest, which can be opened provided the Kongs collected the green key beforehand. The chest will yield a blue key, and the Kongs can follow a passage to the left. A Mama Saw under an open passage. The Kongs enter a tunnel with three Mama Saws. An air bubble supplier lies on the floor at the beginning of the tunnel. Three groups of bananas reeling like a vortex are accordingly located under three large stone lids on the ceiling. Collecting all the bananas in one reel will open the above lid. The first one uncovers several bananas and a heart, the second one dispatches a group of Proximity Mines, and the third one opens up a passage, which leads into a short tunnel containing only a bubble supplier and a string of bananas. Going down the tunnel, the Kongs will exit into narrow shaft going straight down and infested with Pufftups. With repeated corkscrew moves, they should be able to swim against the opposing water currents and reach the blue chest on the bottom, which contains a yellow key. They can exit the area by going back up and into the passage on the top left. Soon they will be flung by currents back to the starting point; the opening in the rocky wall is now guarded by two Red Finleys. Exploring the central corridor again, one can notice that Blue Finleys have been replaced by Red Finleys, and Gordos by Pufftups. Making it towards east and choosing the bottom passage, the protagonists will enter the lofty area with the yellow chest; a Yellow Snaggles swims above the chest. The latter can be opened with the newly found yellow key, uncovering the last key – a purple one. A gigantic gate on the right can be unlocked with the purple key. Driven by currents, the Kongs will access a long passageway and entail a row of bananas, before reaching the goal area, containing several bonus dilapidated barrels and the Slot Machine Barrel. K: Above the group of Tucks at the beginning of the level. O: In the room with the first Yellow Snaggles, above the platform on the right, opposing a Buddy Barrel on the left. The room can be accessed through the top passageway on the east side of the central corridor. N: In a small area beneath the green chest. It is encircled by bananas and protected by a Fritz. G: At the end of the long passageway accessed through the large gate and leading to the finish barrel. Cranky Kong standing near the treasure chest containing the first Puzzle Piece. Inside a treasure chest on a small cliff, accessed via the bridge at the beginning of the level. The player can roll on the ground, jump over a portion of the bridge while rolling and quickly bounce off the bridge and up to the cliff using Cranky Kong. Once the Kongs pound the treasure chest, they will be prompted to collect all of the bananas yielded by the chest in a certain amount of time before the Puzzle Piece becomes available. From the area containing the red key, the Kongs should head into a small opening on the left, leading them to a bonus room. Here, they have to collect all the bananas while hopping from platform to platform in the allotted time in order to obtain the Puzzle Piece. Inside a dilapidated barrel in the area with the yellow chest, at the base of a short wall at left from the chest. Spawned by collecting all bananas in the Pufftup-infested shaft, leading to the blue chest. Right after the Slot Machine Barrel, inside a dilapidated barrel.